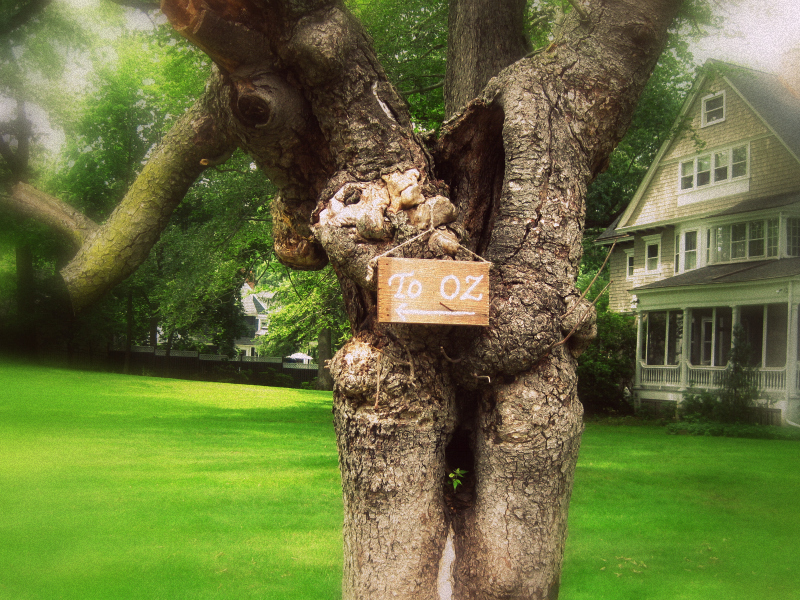 There’s this house on a corner in my neighborhood that I go past all the time, and every time I see it I notice this gnarled tree stump with a sign on it that says: “To Oz” with an arrow pointing down the street. I always wonder what the story is behind the sign. But it almost doesn’t matter, because here’s the thing I love about this sign. My neighborhood is full of big, well-maintained houses surrounded by chemically enhanced manicured lawns and pretty gardens. Here’s a house, on a corner no less, with a large and to all outward appearances, dead tree stump smack in the middle of a large expanse of green grass. Most people would have seen an eyesore, something to cut down and get rid of, or maybe turn into firewood. But someone at this home, whether it’s the current owner or someone who used to live there, saw something else. Someone took a look at this tree and all its knots and twisted limbs and saw a little window into a fantasy world. Kids do it all the time – our living room becomes an ocean, the furniture islands to hop onto. Or the space underneath our bed becomes a hidden cave where we solve mysteries. But somewhere along the way we lose that gift as adults and all we see are dead trees that need to be chopped down. The person who made this sign and left it there to share with everyone who drives or walks by knows the secret: anywhere can be Oz. Not only that, but they want you to know it too. Because seeing something fantastical in the ordinary is better when you can share it with someone else. I know I smile every time I turn that corner, and part of me is squinting a bit to see if I can spot the Oz they saw in the distance. If the sign hadn’t been there, I’d probably just wonder why there was a gnarly tree on such a well-kept property. This summer I’m going to look at the plain old in my environment and try to find the Oz in it – and then share it with the world. I hope you keep your eyes peeled in your worlds and share some magic with me too. Maybe there’s a pirate’s treasure in your backyard, or a yellow brick road behind your office. I can’t wait to hear what you’ve find. Posted in thoughts and tagged imagination, Oz, Tree, Yellow brick road. Bookmark the permalink.